Convenience and proximity to amenities often come top of the wish list for downsizers. That is what makes small cities such as Winchester so appealing for downsizers who want everything in easy reach. At Knights Quarter, the new residential development by Berkeley Homes, a wide range of stylish houses and apartments are conveniently within a short walk of Winchester city centre. The over 55s now account for 75 per cent of all housing equity in the UK according to research by Savills and millions of these have the intention to downsize. But rather than a rural cottage or tranquil bungalow, many would rather live somewhere well connected and close to the action. Figures from Savills show that a quarter of those buying luxury new build property in cities are over 60, affirming the rise of this type of downsizer. Knights Quarter offers over 200 one, two and three-bedroom apartments, penthouses and four and five-bedroom townhouses, presenting a range of options for buyers. Downsizers are spoilt for choice here with a wide range of homes to select from. All have generous living spaces for entertaining and interiors finished with Berkeley’s high level of specification, meaning they will tick the box for even the most discerning downsizer. Set in an elevated position, Knights Quarter enjoys sweeping views toward Winchester’s historic cathedral and just a short walk to its main train station, as well as its excellent shopping, theatre and restaurants. Within the development, there is a well-equipped gym for residents’ exclusive use making it easy to keep active. 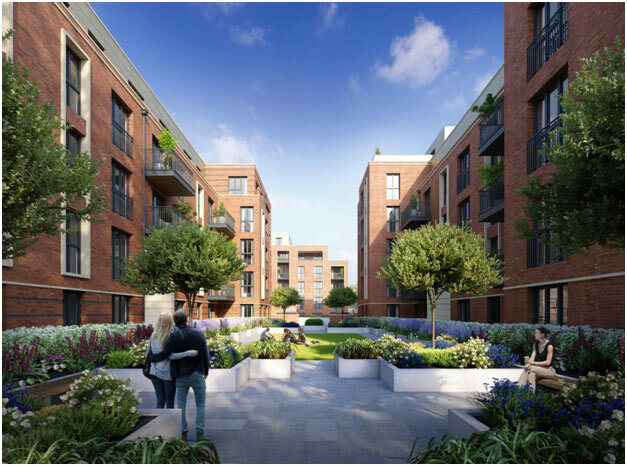 The elegant homes are contemporary in design and the magnificent grounds include plenty of green open spaces and landscaping including a central square and courtyard garden linked by tree-lined streets. With a choice of apartments, penthouses and townhouses, Berkeley Homes has created spatial properties complemented by beautiful luxurious finishes and leading brand appliances. Light filled living areas for entertaining family and friends are well planned and generously proportioned. All homes include sleek fully fitted kitchens where beautiful work surfaces combine with high quality appliances to create the perfect balance of elegance and practicality. Spacious master bedrooms, many with dressing areas, have luxurious en suite bathrooms while additional bedrooms give the option of accommodating guests. Security is often a priority for downsizers who might want to lock up and leave and at Knights Quarter, secure underground parking is available for apartments, as a well as video door entry systems. For those that love the outdoors, the neighbourhood is near beautiful countryside including Winchester’s water meadows and St Catherine’s Hill, while the South Downs and the beaches of the South Coast are easily accessible. Most homes have at least one outdoor space of their own in the form of a spacious balcony, roof terrace or a private enclosed garden. Benefitting from excellent transport connections, Knights Quarter is a 10-minute walk away from Winchester train station offering services in to London Waterloo, with a journey time of approximately one hour. There are frequent bus services within the area, as well as national bus services, and the proximity of the M3 motorway, the A34, A31, A3090 and A272 make connecting to the rest of the country by car very convenient. Prices at Knights Quarter start from £300,000*. For more information on Knights Quarter, call 01962679000, visit www.knightsquarter.co.uk, or contact the Savills Winchester New Homes team on 01962 834 045.